The Juggernaut Method (JM) has become a staple among elite strength athletes and is known for its ability to turn average Joes into incredible performers. But how did it come about in the first place, and what exactly is it? Developed by Chad Wesley Smith of Juggernaut Training Systems, it is a combination of several sources: Jim Wendler’s famed 5/3/1, the training style of Doug Young (a legendary powerlifter who held multiple word titles throughout the 1970s), and simple block periodization. Knowing a bit about the author of any given plan is important—it helps to speak to the plan’s credibility. You wouldn’t go to a dentist with bad teeth and you shouldn’t use a lifting plan made by a weakling. It’s just common sense. But Chad is far from weak. Setting national records in the shot put, he then moved on to dominate the world of powerlifting—setting the American world squat record at a whopping 905 pounds (this record has since been broken but his legacy has anything but disappeared). With that said, Chad is not your typical meathead lifter (cough, Johnny Pain, cough). He is the owner of JTS (and its accompanying powerlifting gym) and his strength is only surpassed by his intelligence when it comes to designing highly-effective training plans. Using the JM, you’re in good hands. Chad Wesley Smith pulling in competition with legend Ed Coan in the background (red shirt). Different from our other powerlifting programs and routines, the JM is more of an open-based template which allows each individual to focus their efforts towards their own specific needs and goals. This allows athletes to take advantage of the highly-effective structure and programming technicalities found in powerlifting plans while also accommodating for conditioning a sports-related work. If you are an athlete looking to get big, strong, fast, and powerful—the Juggernaut Method Training Program was literally designed specifically for you. But if you are a strictly a powerlifter—don’t worry—you’re in good hands. Chad’s claim to fame is his powerlifting prowess and the JM goes above and beyond to help add strength and also accommodate for necessary hypertrophy (muscle growth) important for long-term progress. As you will learn below, this is done using intelligently-designed training “waves”. Before going any further, it is important to point out that this routine is not designed for a beginner powerlifter or strength athlete. The periodization techniques used are best suited for intermediate and advanced lifters who already have a solid foundation; our powerlifting for beginners guide covers everything you need to know if you don’t fit into these two categories. With simplicity one of its main goals, JM is focused on scientifically-backed progressive overload. Adjusting percentages slightly from workout to workout, it ensures incremental but consistent gains which lead to new rep maxes. But why rep maxes and not just maxes (1RM)? In his own training, Doug focused on utilizing a last-set rep-max (AMRAP sets—as many repetitions as possible), much like the Greyskull LP program. For example, after performing his given sets and reps for a training session he would perform one last set and do as many repetitions as he possibly could. He would then use this new record to adjust the weights he used for the next week. 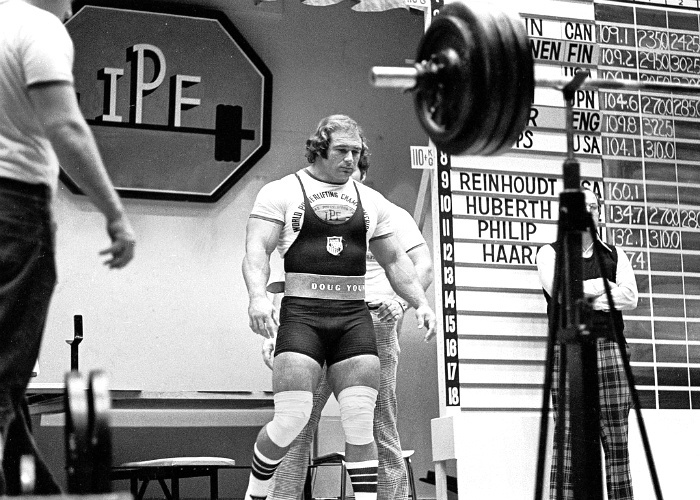 The fundamental difference between his style of training and others was that he used his performance to dictate the weights used—and not just some static number based on unwavering percentages. Each “block” lasts for a period of one month. This time period is highly-optimized for intermediate and early-advanced lifters. If you are an elite or highly-advanced lifter, you will want to extend these blocks to 2 months or longer. Interestingly, while the JM was developed by Chad Smith who is well-known throughout the strength community for his freakish powerlifting abilities (placing top 10 in the world in 2011 with a 2165 pound total), it is designed to be used successfully by any and all athletes looking to improve their strength, power, and speed—whether that be an offensive lineman, a strongman, or a powerlifter. Furthermore, Chad believes that while athletes of differing backgrounds obviously train very different—a cyclist’s workouts are far from what a rugby player would ever consider completing, for example—there are four unifying aspects that are found across all elite performance programs. Sprinting: the highest velocity activity a human can complete, sprinting is broken down into three different categories—acceleration, maximum speed, and speed endurance. Take a look at any high-level sprinter and you will see a jacked, lean, and athletic specimen argues Chad. Jumping: used to develop explosive power, jumps are utilized because they come at a lower recovery cost than sprints. Jumps are not just limited to the lower body—upper-body jumps such as pushups onto boxes and clap pushups are excellent ways to improve explosive power throughout the upper body. Throwing: Chad argues that medicine ball throws have several distinct benefits over olympic lifts in that they do not require extensive skill and form to correctly complete—while still providing an athlete the ability to improve and enhance his or her explosive power. Lifting: the obvious one, Chad goes further to make an important distinction—submaximal By using weights within the 60-90% range and focusing on lifting them at maximal speed and force output, your muscles receive adequate stimulus without taxing your nervous system from heavy, heavy weights (greater than 90% of your 1RM). This also helps to avoid injury and prevent high levels of fatigue from overtraining. It is important to point out, however, that sprinting, jumping, and throwing are all focused towards holistic athletic performance—building faster, more capable competitors. 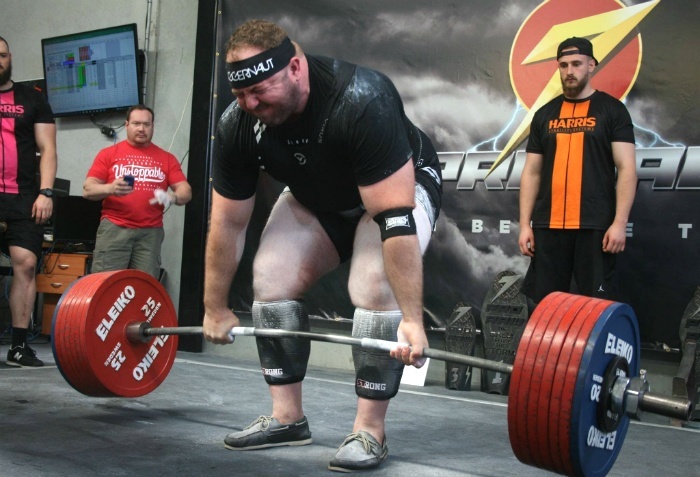 As a powerlifter your focus should be on the actual lifting portion of the program. While jumping and throwing should be included during the initial phases of the plan to help encourage work capacity, variety, and GPP (general physical preparedness), they should disappear in the final stages of the plan. Sprinting, however, has a tremendous carryover to squats and deadlifts—you should find a way to incorporate them every week. Additionally, the plan is divided up into four distinct “waves” of periodization. Each wave contains three different phases (the ones mentioned towards the beginning of the article), and each phase consists of 4 training sessions—one for each of the four lifts above. Before starting the program you will need to determine your working max—this is the max you will use to determine how much to lift for all training sessions. When choosing this number, do not use a hypothetical weight that you “could have hit” or “used to lift” in the past—it should be a conservative value that you have lifted within the past 6 to 8 weeks. The more conservative you are with this number, the better your progress will be. Choosing a number too high will simply destroy the entire purpose of the program—which is to start at a higher volume (moderate to light weight) and then increase in intensity over time. It is highly recommended that you multiply whatever you think your max is by .9 and use that number—it will be less weight but ensure high-quality workouts each and every time you set foot in the gym. And it is always easier to add more weight to the bar than to take it off—that is simply demotivating. With the warm-up out of the way, you are ready to dive into the actual program. Mentioned above, each week you will have 1 training session devoted to each of the four lifts. This means you will be in the gym four days a week. This can be split up any number of ways depending on your schedule; with that said, you should ensure a recovery day is planned in between your lifts to accommodate ample recovery. If the above doesn’t fit your individual needs or schedule, feel free to change it up—just make sure you aren’t lifting four days in a row. Chad Wesley Smith also includes a 3-day-per-week option which allows for increased focus on conditioning work such as sprinting and jumping. In this case, he recommends combining the overhead press and deadlifts on the same day. If you are an athletic powerlifter (an athlete looking to take advantage of the tried-and-true methods of powerlifting at getting big and strong) this will be the option you choose and will allow you enough time and recovery resources to focus on your sport and conditioning. With the important details out of the way, it is time to dive into the program itself. In total, the plan is designed to be ran and completed over the course of 16 weeks. Now, consider each of these as muscles. The storage shed is synonymous with a lifer who has only just begun and has a small amount of muscle. The skyscraper is synonymous with an intermediate or advanced lifter who has a large amount of muscle mass. In this example, a wrecking ball comes in to destroy both buildings—this is synonymous with lifting weights: your muscles are turn down and degraded after intense use. Now, after the fact, your body is responsible for rebuilding the damage to become stronger. Consider this: what takes more energy to rebuild? A storage shed or a skyscraper? Clearly, the skyscraper requires much, much more effort to rebuild. This example illustrates recovery resources brilliantly: the stronger you get, the bigger your muscles are, the more recovery resources it takes to rebuild and recover. This means as you get stronger, you must always walk the balance of working out hard enough to get an effective stimulus, and not pushing into the “red zone” where you are unable to recover adequately from training session to training session. The best way to do this is to avoid lifting at a very, very high intensity and instead focus on progressing using rep maxes and lifting high amounts of volume while still completing enough moderate to high intensity sets to produce the neuromuscular adaptations required for maximal strength. The juggernaut method accounts for this balance perfectly. And interestingly, evidence also points to high volume and low intensity as the best recipe for beginners as well—but for a different reason: hypertrophy. Beginners simply need to build a base of muscle and high volume programs do just that. Week 1: Accumulation—high volume, light weight used. Leave 2-3 repetitions “in the tank” on the AMRAP set. Week 2: Intensification—medium volume, medium weight used. Leave 1-2 repetitions in the tank on the AMRAP set. Week 3: Realization—low volume, high weight used. Leave nothing back on the AMRAP set—go as hard as you can. Week 4: Deload—recovery. No AMRAP sets. These waves are also known as micro-cycles if you are familiar with the insanely-powerful muscle and strength principles backed by science. The reason for planning the program like this is based on the now-famous teachings of Tudor Bompa who revolutionized sports training with the concept of periodization—altering volume and intensity in a smart way to produce the best results, in this case maximal strength. While training using the 10-rep wave, hypertrophy and muscular development (gains) are prioritized. While training using the 8-rep wave, hypertrophy is still a focus but the intensity is increased ever so slightly to begin preparing you for heavier weights. While training in the 5-rep wave you begin to focus on strength—five repetitions is a strong middle ground between size and strength. Finally, while in the 3-rep phase you are fully focused on maximal strength. It is important to point out that these repetition ranges are not set in stone—your body is an adaptive, highly-complex physiological machine. For example, your body doesn’t say, “oh wait, I’m not supposed to get stronger because you’re lifting with 10 repetitions”—it doesn’t work like that. Studies show that high intensity, low-volume training produces the most strength and muscle over an 8-week period. But that misses a large point of doing higher repetitions: building work capacity and skill that translates directly as periodization is employed and heavier weights are introduced. Bottom line: by altering repetitions and intensity you get the best of both worlds. The Juggernaut Method does this beautifully. The actual, specific schedule of lifting (what days to do which lifts) does not matter and can be adjusted to fit your individualized needs as explained earlier. Percentages mentioned below are a percentage of your working max that you determined earlier in the article. 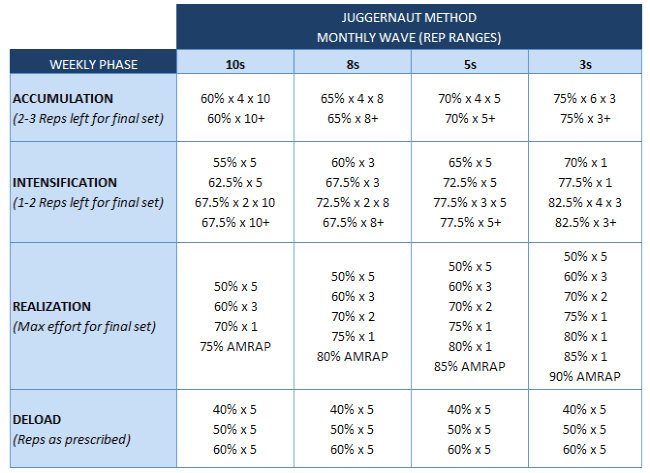 What About Juggernaut Method Accessory Work? You will notice that only the main lift is included within the program. If you are unsure of how to program secondary movements and accessory lifts, take a look at the 8 week powerlifting routine (it also happens to be our most famous program to date). Progressing from week to week is a critical component of the program—it’s where the AMRAP sets come into play. On the third week of each month (the realization phase) you complete an all-out AMRAP set that is designed to see how much you have improved. Using your performance on these sets, you are then able to re-calculate your working max. Using the example above of 5 extra repetitions, you would add 12.5 pounds to your bench press/overhead press and 25 pounds to your squat/deadlift. By altering the weight you use each week, you are able to “auto-regulate” your training. In other words, instead of sitting back and relying on a static number, you are able to push your body and elicit the perfect amount of stimulus to your muscles—resulting in fully-optimized progress that gets you stronger and bigger in the fastest way possible. Recovery is also an important aspect that must be covered. As you get stronger and bigger, recovery becomes more and more important (hence the shed-skyscraper adage mentioned earlier). As you complete the JM strength training program and enter the realization phase, you must begin to eliminate some of the conditioning aspects of the program—aka the sprinting, jumping, and throwing. This is because, as a powerlifter, you must train in a highly specific manner during the peaking phase of the program (which JM refers to as “realization”—realizing all of your hard work in the form of increased strength). Mentioned earlier, sprints will be the main form of auxiliary conditioning you include if you are a powerlifter. Once you reach week 9 of the program, it is time to drop the sprints and focus 100% on the heavy lifting days while making sure to get adequate rest on your days off from training. The good news is, this routine does an amazing job of managing fatigue and making sure you can recover from lift to lift—cutting back on the sprinting during the final weeks will ensure you are absolutely maximizing your hypertrophy and strength gains by allowing your body to recover (which is when you are actually making “gains”). These lifts should be done before the AMRAP set during the realization phase of the routine. As you prepare to begin your next training cycle, and are looking for a program based in science, give the JM a serious consideration. 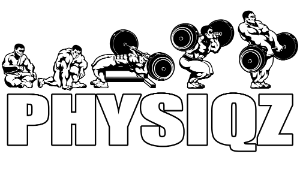 The scientific and pragmatic foundation the plan is built around is only superseded by the amazing results it has produced in a number of elite competitors—from NFL athletes to world-record-holding powerlifters and strongmen. Just make sure you’re willing to put in the serious work it requires. If you do—prepare to reap the rewards of intense progress towards your strength and muscle goals. © 2019 Physiqz. All Rights Reserved.